My blog is not quite 3 months old. I’ve had visits from 44 countries and 48 states. (Where are you Vermont and New Hampshire?) I’m just a pinhead in “the Land of Shiny Things.” I had no illusion that anyone (except maybe my mother and sister) would be interested in anything I have to say. I did not fully grasp the fact when I began to “book” and tweet and blog that I would be a “digital scribe.” I did not realize the potential snowball effect of a single post or tweet. I had never heard the word “sticky” used in a context other than those such as dried orange juice on my kitchen floor or hair matted with gum. And now Tami and Toni present a field guide for Christ followers in @stickyJesus: How To Live Out Your Faith Online, for those of us who want to be online light shedders and dark shredders using social media to share our stories and offer hope to those who hurt. For those of us who seek and share. For those of us who long to share the stickiest of messages. 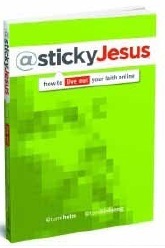 This book drips Jesus and challenges us to stick to Him as we build and interact with our online community. Tami and Toni call their chapters “files” and summarize each in a “download” and end with an “upload” prayer. They include stories of real people making a difference online for real people. They provide hints and helps for dummies and geeks in an easy-to-read, hard-to-put-down format. The ends of the earth sit at our fingertips. And we are here for such a time as this. Do you want to make a difference for Jesus as a “digital scribe?” Get. This. Book. And check out the @stickyJesus website. We’re a generation raised on instant: Instant formula. Disposable diapers. Satellite TV. GPS navigation. Online check-in. Automatic everything. We’re always plugged in and wired. We’re accustomed to having answers at the snap of our fingers. We’re used to being in control. How does this affect our communication with God? This is the question iFaith seeks to answer. What has life at warp speed done to our souls? Has faith been replaced with a false sense of security? Has the digital and technological revolution made us more impatient with the God who delights in making His people wait? Daniel Darling has his finger on the pulse of today’s technology. 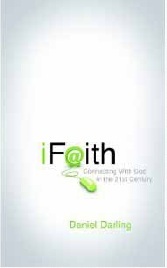 In his newest book, iFaith: Connecting with God in the 21st Century, he speaks to the “card carrying members of the instant generation” among us with sound biblical advice on the basics of Christianity. There are several witty illustrations throughout the book, some public and some personal. All are on-point. Scattered throughout are select Bible verses (ESV, NLT, and KJV) and quotes from some of my favorite authors like Josh Harris, E. M. Bounds, Ray Prichard, and Oswald Chambers. The writing is witty, genuine and honest. Because each of the ten chapters end with a list of discussion questions and a resource list, this book is ideal for a youth or young adult bible study group. The timeless truths presented in the book would make it perfect for any Church library. I recommend it highly. These are among the many Christian book reviews available at The Vessel Project. Reviews used with permission.